CLINTON TWP. — EntirelyBiz, a managed IT services provider, announced that the company is now offering a service called SD-WAN, for Software-Defined Networking in a Wide Area Network. SD-WAN simplifies the management and operation of a WAN (Wid e Area Network) by separating the networking hardware from its control mechanism. An SD-WAN enables businesses to build higher performing – lower cost WANs using the Internet. This enables companies to partially or fully replace expensive private WAN connections such as Multi-Protocol Label Switching (MPLS). The research firm Gartner forecasts 30 percent of enterprises will deploy SD-WAN in their satellite offices by the end of 2019. SD-WAN is a specific application of software-defined networking (SDN) technology applied to WAN connections which connect business networks – including satellite offices and data centers – over large distances. In the past, WAN connections were often controlled and secured using proprietary hardware, SD-WAN moves control into the “cloud” with a software approach. 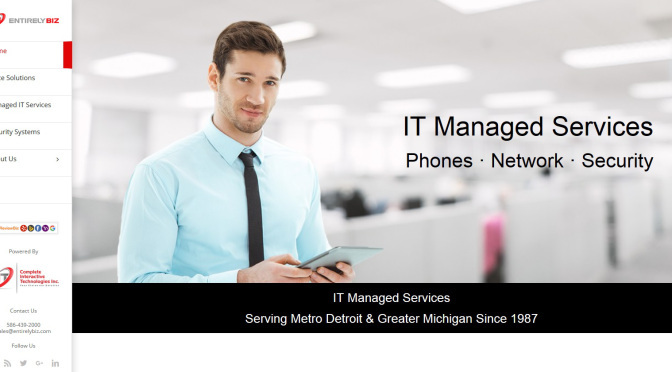 EntirelyBiz is a managed IT services provider offering structured cabling, network infrastructure, cloud migrations, mobility, business phone systems, and business security systems to mid-size and small businesses. It is a brand of Complete Interactive Technologies Inc.